Garrett Neese/Daily Mining Gazette Houghton County Commissioner Gretchen Janssen talks with Houghton resident Candy Peterson during her first open office hours at the Portage Lake District Library Saturday. Janssen plans to hold the sessions quarterly to seek input from constituents. 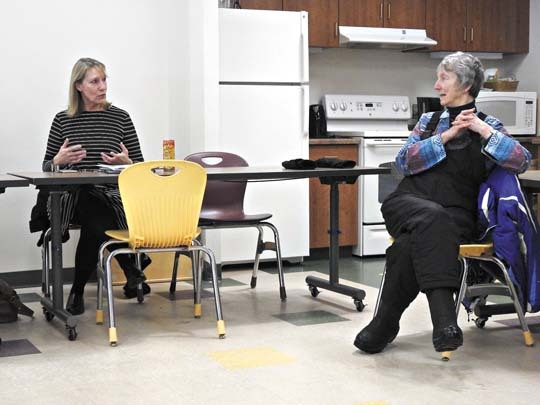 HOUGHTON — Houghton County Commissioner Gretchen Janssen hosted her first open office hours with constituents Saturday at the Portage Lake District Library. The meetings were a campaign promise of Janssen, who represents Houghton on the board. She was appointed as an interim member in June before winning a full term in November. 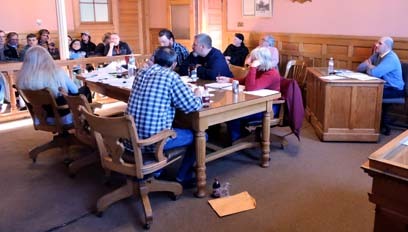 Janssen said the issues in which she is been most involved are recycling and what to do with the Houghton County Jail. On recycling, Janssen said the county’s Solid Waste Committee is looking how efficient the current system is. It is also talking about collections of other materials such as e-waste, household hazardous waste and tires. County resident Candy Peterson said recycling is an issue where the board might need to lead the public. Janssen said cost is an issue, as well as the method of doing it. Single-stream recycling, as opposed to people separating materials, provides stronger incentives, Janssen said. The jail took up much of the hour-long session. The county board will also have a Committee of the Whole meeting about the jail at 2 p.m. March 11 at the fifth floor of the Houghton County Courthouse. A millage proposal to build a jail addition behind the courthouse narrowly failed in November. One county resident said he had voted against the proposal because he had felt overtaxed as a owner of multiple properties. He said he had also seen increases due to the taxable value becoming uncapped upon his inheriting the property. The state Legislature has since reversed the uncapping of taxable value for inherited properties, but did not grandfather it. Janssen said people have still talked to her about moving the jail to the former Camp Kitwen site in Adams Township. Sheriff Brian McLean said the county has looked at it in the past and found it to be cost-ineffective. “Unless you put the entire county complex there, change the county seat by popular vote to Adams Township, but do you think the North End is going to want to drive to Painesdale instead of Houghton or Hancock?” McLean said. Janssen said afterward she had not known what to expect from the meeting, although she had predicted the jail would come up. “I thought the input was really useful,” she said. Janssen said other members are also invited, provided only one shows up at a time. Only fewer than three commissioners can participate in an unofficial meeting, as that would constitute a quorum. 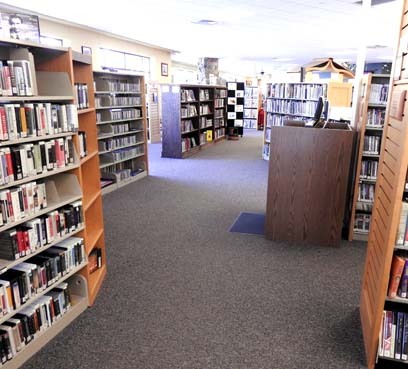 The next meeting will take place from 2 to 3 p.m. May 25 at the Portage Lake District Library community room.